On the user’s profile page, scroll down to the Restrict Author Post to a category section and select the category for the user to post into. Is it possible to us this plugin somehow, to limit posting to a category of a custom post type? 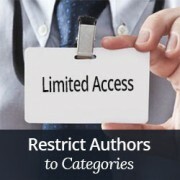 This is the plugin I use in which i want to limit various authors to their own categories. How to restrict a role to two specific categories? Apparantely, the plugin does not support this feature at the moment. how about the author to two or three specific cats? how to make published posts editable by allowed authors but need to be approved by administrator? Author A updates Employee A Post, nothing changed with online version but post is saved as pending review, email sent to administrator, who review changes and allow publish or discard changes. can this be doable with Edit Flow? You can create a custom user role with these capabilities see how to add or remove capabilities to user roles in WordPress. i have created the custom user role and i assign him edit published posts, but questions is how to make published post enable to be edited but not published again until admin review changes and allow to publish post. like Employee A page already published and online for viewers.. Author A assigns to Employee A page.. Author A do changes to Employee A page, now changes don’t get publish but email sent to administrator that changes to Employee A page has been made by Author A.
administrator either approves changes or discard changes. on approval Employee A page online version updated for visitors. If you are using the plugin we mentioned then you need to edit the user role and uncheck the Publish capability from that particular user role. I managed to get it in working. i used “Capability Manager Enhanced” plugin along with “Revisionary” Plugin. now published posts are submitted for review before going to publish online. but now issue is we are using Custom Fields by using “Advance Custom Fields” plugin on Custom Post Type “Employee”, in Revisionary preview screen, we are not able to see those Custom Fields but only WordPress default Editor. Is it possible to get Custom Fields Updates in Preview Comparision?